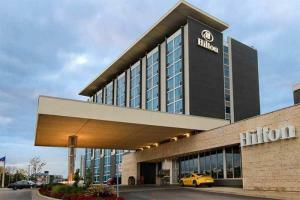 Situated directly across from Pearson International Airport, this hotel is also well located to popular attractions such as Woodbine Golf Club and Canada's Wonderland. Downtown Toronto is easily accessible via the UP Express train, a quick shuttle ride from the hotel. 419 guest rooms are decorated with a modern sensibility and offer amenities such as WiFi and flat-screen TVs for your convenience and entertainment. The hotel features a well-equipped fitness center and a welcoming restaurant and bar. Located right by the the Toronto Pearson International Airport.